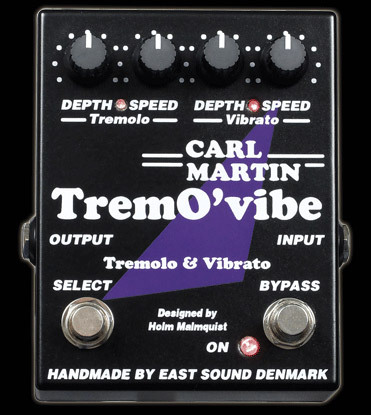 TremO´vibe, Multi-effect or other modulation effect from Carl Martin. 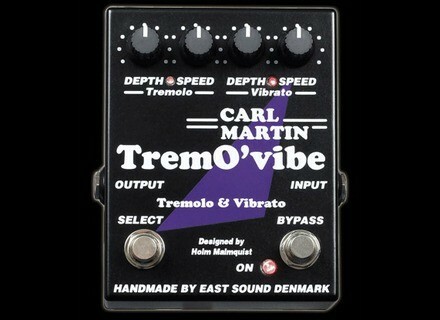 As its name implies, a tremolo pedal that makes or vibrato. 2 knobs for trmolo and 2 to settle for vibrato speed and depth. A bypass button and a button to switch between the other end. Nothing simpler. Few settings, but very ffective. I did not look the manual. Little originality it has no external transformer, it plugs directly into the 220V. I think the key word of this effect is "transparency." I think it does not alter any of the original sound of the instrument. It may not seem like much, but I tried other pedals like, which literally ate part of the sound. The bypass is also very pure. I use it with electric guitars, and with either single or double coil, clean sound and distorted sound rendering is fantastic. What I like most is the simpllicit and transparency effect. I had several other models before, but none was so pure, and with such a nice sound reproduction. The only default if we find is that it is massive enough, but hey she looks extremely solid. Without hesitating I buy the same!